Earlier today, Rica and I were discussing how my ManilaSpeak articles were doing. Turns out that the most viewed article I have at the site is my liempo recipe. 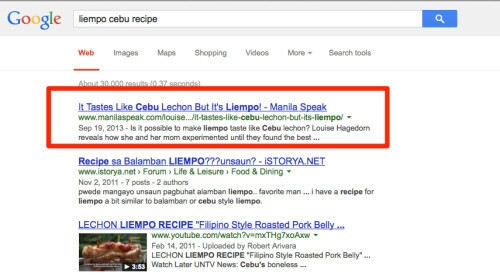 Apparently, when you do a search for liempo Cebu recipe, it’s the one on top. I’m tickled! It’s not easy to get a Google search result like that.